This Affordable Boutique hotel is located close to downtown Gaslamp District in San Diego. Bus and Trucks are Welcome, Guest Laundry, NO Pets Allowed, Military Discounts, 24 Hour Desk . Includes pastries, cereal, donuts and fresh coffee. Take a refreshing dip in our Year Round Outdoor Pool. Newly Remodeled, Fridge, Microwave, Hair Dryer, Coffee Maker, Desk. Cable TV with extended channels and Boutique style Bathroom. Cassia Hotels near downtown San Diego is conveniently located next to the 5 freeway, providing easy access to all of San Diego’s popular attractions and destinations. Within 15 minutes of our front doors, visitors can walk along the San Diego Harbor, explore Downtown San Diego or take a scenic day trip down Mexico’s coastline. We are also proud to be one of the trusted Naval Base San Diego hotels 32nd St. Naval Base, regularly providing discounted rooms for visiting family members. Our spacious rooms are perfect for a quiet reprieve from business meetings, a romantic getaway, or a family vacation. When you book a room at Cassia Hotels you know you’re getting the best deal on a hotel room near downtown San Diego. Our guests have the option of choosing between our Deluxe King Suite and Two Queen Room, both of which are available as non-smoking rooms. 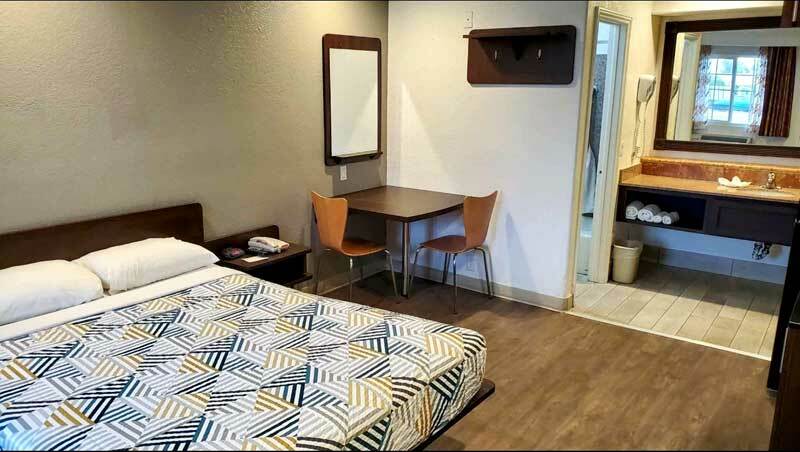 Every Cassia Hotels hotel room also comes complete with the comforts of home including an in-room refrigerator, microwave, alarm clock radio, premium cable TV and free wireless internet. Cassia Hotels located near downtown San Diego offers 56 smoking and non-smoking guest rooms. Guests have a choice of one king bed, perfect for business travelers and couples, or two queen beds to comfortably accommodate families and larger groups. 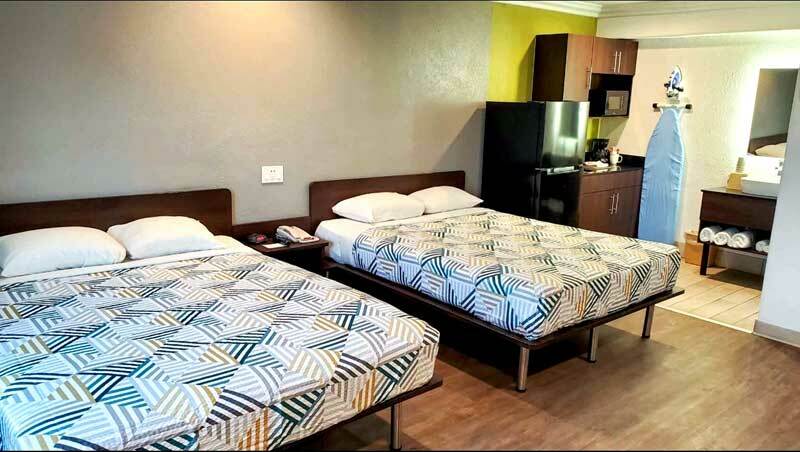 All rooms feature a microwave and refrigerator and are equipped with wireless internet and premium television programming at no additional cost. 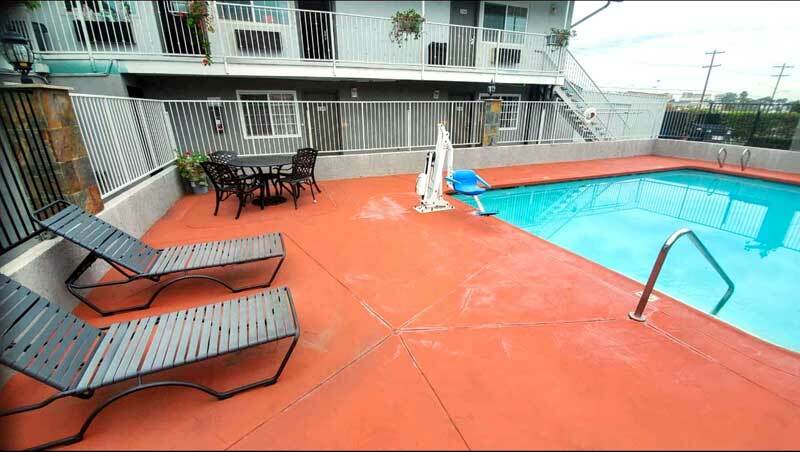 Along with a clean and comfortable room, Cassia Hotels’ guests have access to our outdoor pool. We also have a 24-hour front desk where our friendly multilingual staff can help with any of your travel needs, whether you’d like to schedule a wake-up call or would like recommendations for places to dine, shop and sightsee. After exploring San Diego’s South Bay, we invite you to relax in one of our comfortable and clean rooms or suites – ideal for families, couples, business travelers and conventioneers. With Cassia Hotels close to downtown San Diego, you can book with confidence knowing we have the budget accommodations and discount package to meet your individual needs. Current Events in National City, Ca. You are warmly invited to the 5th Annual Children's Mental Health Well-Being Celebration! This year's event will be celebrated at the ARTS Center in National City, CA. This FREE event celebrates all children, youth, and families engaged in the Children, Youth and Families Behavioral Health System of Care. This is a 102 mile ride taking you out from Pepper Park in National City nice and bright and early and well head out through downtown SD to the familiar Rose Creek bike path and continue to the out skirts of La Jolla to a pit stop at mile 20 and then continue onward and inland through some rolling hills side and the beauty of Ranch Santa Fe as we work our way back towards the Coast. Pit stop 2 at mile 43 and then back Coast side and onward to lunch. Lunch will be in Oceanside at Jersey Mikes. The second half of the ride is mostly California Coastal with a Pit stop at Fletcher Cove at mile 73.3. Jamie will have refuel supplies for us there. Refuel folks you’ll need a little boost to climb Torrey Pines at mile 77. Once that’s done an easy 22 miles to the finish line! Activities : San Diego Mission Bay has cool breezes, tranquil waters and soft sand beaches that attract recreational enthusiasts to Mission Bay and the Beaches throughout the year. Airport : Getting to San Diego International Airport is easy from most major roadways. Be sure to monitor traffic conditions during certain times of the day. It is essential to allow yourself enough time for airline check-in and to pass through security. Arrive two (2) hours prior to domestic flight departures and three (3) hours prior to international flight departures. Attractions : Read about Tijuana, Mexico. Did you know Tijuana is the world's most-visited border city? Many visitors find Tijuana intimidating, but if you read our guides, you'll be prepared for Tijuana. Learn how to cross the border to Tijuana and come back, find out how to get around Tijuana. Get a preview of Tijuana on a photo walking tour and learn the best places to shop in Tijuana. And if you take our luxury tour of Tijuana, you won't be able to stop telling your friends about it. Attractions : San Diego is home to many of Southern California's popular tourist attractions that provide fun, exhilaration, education and excitement for adults and children of all ages. Casinos : The excitement of Vegas, plus everything for an ultimate Casino experience, is right here in the Temecula Valley. We have lots of Casino action if your game is Slots, Blackjack, Poker, Craps, or Roulette we have something fun for everyone! From intimate high-limit rooms to non-smoking gaming we have what you need to get the action started. You will also find fabulous food and entertainment. Dining : American Restaurant. No-frills, family-friendly restaurant serving breakfast all day as well as sandwiches & burgers. Downtown : The heart of every city lives in its downtown, and San Diego is no exception. Located only minutes from the airport, San Diego's thriving downtown districts offer a plethora of options for accommodations, activities, dining and cultural attractions, all accessible by foot or by trolley. Modern and historic buildings stand side-by-side, in the downtown historic Gaslamp District, housing shops and boutiques, trendy nightclubs, rooftop bars and fine dining restaurants. Golf : Golf Digest named San Diego "One of the Top 50 Golf Destinations in the World". We have over 90 courses located throughout the San Diego region, from seaside settings to desert mountains to inland valleys. With a wide range of courses, there is a course for every type of golfer and a range of greens fees that will fit every budget. Government : Helping businesses in San Diego grow and flourish is a major focus of the City of San Diego. The City is dedicated to helping foster the region's economic base to improve the quality of life for its citizens and business community. Through many continuing programs and projects, the City creates opportunities for businesses to succeed. Hospitals : Paradise Valley Hospital is the South Bay's oldest hospital. In fact, we are the second oldest hospital in all of San Diego County, and the largest employer in National City. For more than 100 years, Paradise Valley Hospital has served San Diego faithfully, proud of our heritage and providing numerous programs and services to meet the changing needs of our community. Shopping : Whether you are window shopping, picking out a souvenir to bring back home, or buying an entire new wardrobe; you won't be disappointed with the abundance of shopping choices that San Diego has to offer. With an average temperature of 72 degrees the variety of outdoor shopping malls, shopping centers, vintage/antique stores, and quaint neighborhood boutiques, San Diego offers a pleasant yet energized atmosphere to partake in some San Diego shopping. Sports : he San Diego Padres are a Major League Baseball team based in San Diego, California. They play in the National League Western Division. Founded in 1969, the Padres have won the National LeaguePennant twice, in 1984 and 1998, losing in the World Series both times. University : San Diego State University is the oldest and largest higher education institution in the San Diego region. Since it was founded in 1897, the university has grown to become a nationally ranked research university. Each year, SDSU provides more than 35,000 students with the opportunity to participate in an academic curriculum distinguished by direct contact with faculty and an increasing international emphasis, preparing them for a global future. Welcome to our great hotel in National City California with affordable rates and cheap budget discount lodging. Cassia Hotels San Diego Boutique welcomes you to our budget hotel in National City California. 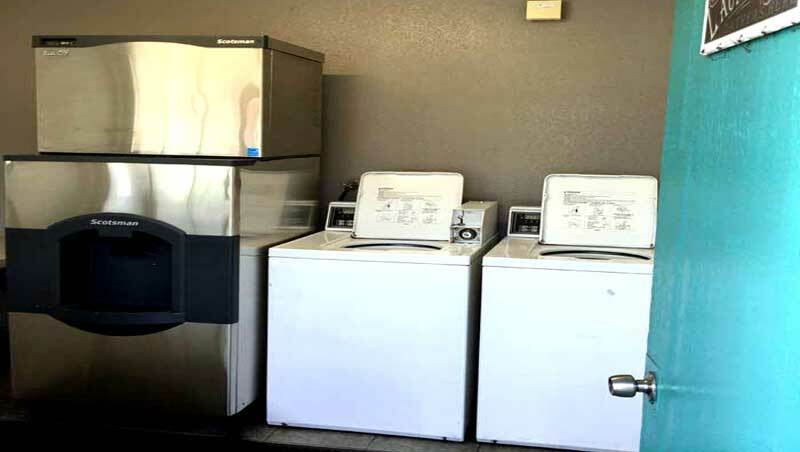 Cassia Hotels San Diego Boutique will provide you excellent customer service with great amenities in comparison to all Hotels and Motels in National City California. Please visit us on your next stay in National City California and let us provide you with 4 star hospitality for 2 to 3 star budget rates. Cassia Hotels San Diego Boutique has been providing lodging and accommodations in National City California for several years and looks forward to providing our valued customer and business traveler with the best service in National City California for Hotels and Motels in our local area.